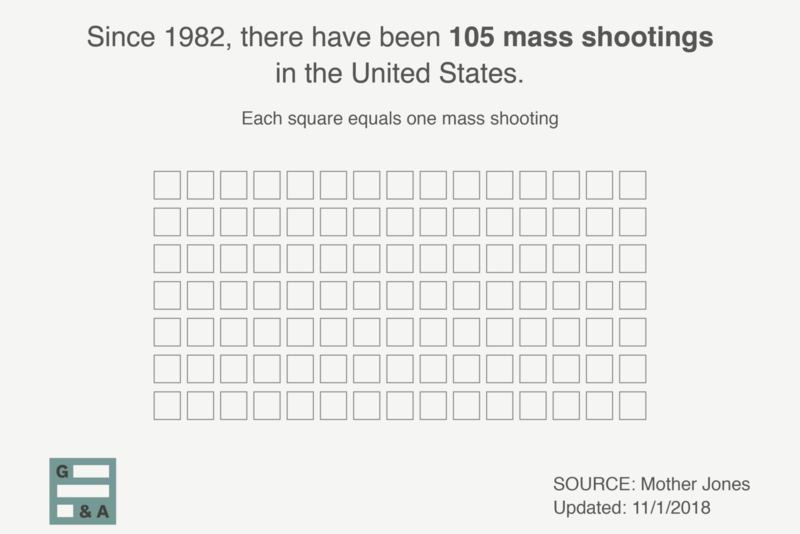 Since 1982, there have been 105 mass shootings in the U.S., most of them involved guns bought legally. In the aftermath of a mass shooting, a recurring question arises: How did the shooter get the gun? In most cases, the perpetrator legally bought the firearms in question. 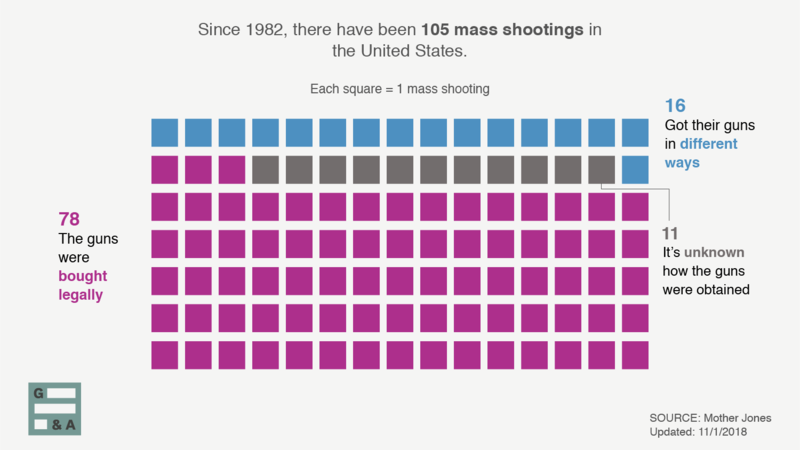 Of the 105 mass shootings committed in the U.S. since 1982, 78 (or 74 percent) involved firearms obtained by legal means, as shown in this analysis of the mass shooting database created by news organization Mother Jones. Since 1982, there have been 105 mass shootings in the U.S.
78 of the shootings involved firearms bought legally. What’s considered a “mass shooting”? There is no standard definition of what constitutes a mass shooting, which can make analyzing mass shooting incidents difficult. It can also lead to different results in studies of mass shootings. The Mother Jones data used for this visual defines mass shootings as public attacks in which the shooter and victims were generally unknown to each other, and four or more people were killed. The data set excludes all multiple murders related to drugs, gangs or domestic violence. Where did the rest of the guns come from? 74 + 15 does not equal 100. What about the other 10 percent? In 11 of the mass shootings — roughly 10.4 percent — we don’t know how the shooter obtained their firearms. 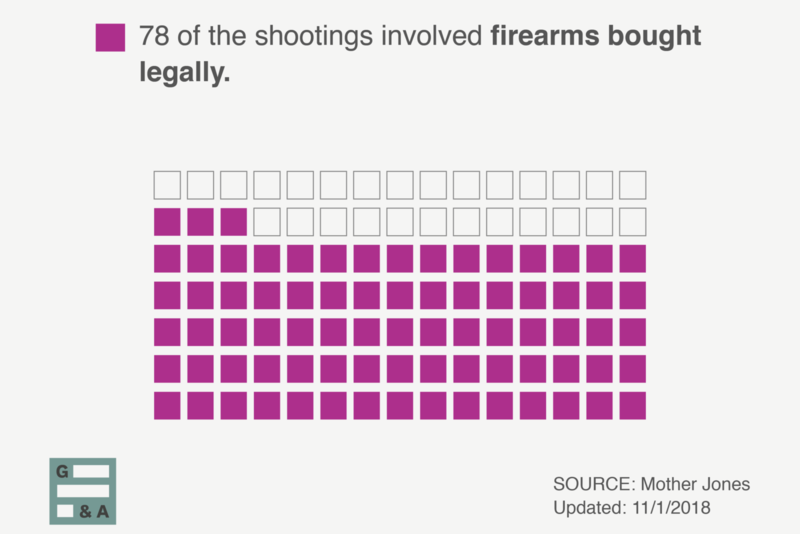 Most of the firearms used in mass shootings were bought legally. While we started with data from Mother Jones for this visual, there are numerous other studies that support our findings and can provide further resources. For example, The New York Times recently studied 19 mass shootings and found that in the vast majority (more than 75 percent) of instances the firearms used were bought legally with a federal background check. This group does not include the Tree of Life Synagogue shooting in Pittsburgh, but the ATF concluded the alleged perpetrator of that shooting legally purchased the 10 guns he owned, including those allegedly used in the shooting. In October, The Washington Post studied 156 public mass shootings in the U.S. dating back to 1966 and found that 77 percent of the guns used (where there was information on how the gun was obtained) were bought legally. Last June, the FBI studied dozens of active shooting incidents between 2000 and 2013 and found that only 2 percent of the active shooters studied purchased firearms illegally. The data was compiled by Mother Jones and was updated by Guns & America. In some cases, additional reporting suggested changes to how Mother Jones had categorized the method the shooters used to obtain the firearms used.